Product prices and availability are accurate as of 2019-04-11 00:04:56 EDT and are subject to change. Any price and availability information displayed on http://www.amazon.com/ at the time of purchase will apply to the purchase of this product. 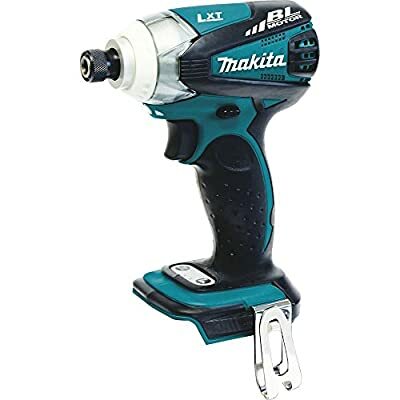 The Makita 18V LXT Lithium-Ion Brushless Motor Cordless 3-Speed Impact Driver (model XDT01Z, tool only) combines longer run-time with more torque and 3-speed power selection for maximum versatility and performance. The XDT01Z is engineered with a Makita BL Brushless Motor for up to 50% longer run time, increased power and speed, and longer tool life. In addition, the 3-speed power setting offers precise fastening control for a wide range of tasks - from cabinet screws and deck screws to lag bolts, and much more. The variable 3-speed power selection switch has soft, medium and hard settings that deliver 0-1,300/0-2,000/0-2,600 RPM, 0-1,300/0-2,800/0-3,400 IPM, and 200/490/1,460 in.lbs. of Max Torque for a wide range of fastening tasks, from cabinet screws to lag bolts and more. Makita's proprietary hammer and anvil impact mechanism are manufactured using the best raw materials with the highest quality steel and unique heat hardening process for maximum fastening and driving power.